The nature of the cloud and the opportunities it presents requires a systemic approach to organizational effectiveness, affecting disciplines that may seem far removed from information technology. Theories and practices of management often spring from the opportunities created by new technologies. Interchangeable parts spurred ideas about structuring assembly lines and logistics. The complex calculations of the field known as Operations Research were enabled by mainframe computing. Client-server technology begat enterprise resource planning systems, and the consequent system-wide visibility that was required for what we call business process management (BPM). That makes it imperative to start thinking about how management will be changed by the most impactful information technology of our time: cloud computing. What does it allow us to do differently, and how will that change the way we do things in the future? History suggests that the main way information technology changes management is through changes in how information is gathered: the large-scale analysis of Operations Research reflected painstaking data collection around a few metrics, which were transferred to punch cards. BPM reflected the interactions of different stakeholders, from product creation through supply chain to final assembly. With cloud, information travels rapidly in both directions, across computing systems that, with attributes like virtualization, scaling up or down to handle bigger workloads, or automated security patching across thousands of machines, are far more flexible. This will likely mean a more flexible work structure as well, in the interest of products and services that ideally can be adjusted to anticipate customer needs. Key to the new system are rapid data collection and analysis, followed by over the air changes to product software. Likely outcomes of the move to cloud include changing how products are designed; closer collaboration between the corporate IT department and other business units, including sales, finance and forecasting; and more customer interaction, even to a point of jointly developing products with their consumers. In particular, new ways of writing and deploying software will encourage new types of faster-acting organizational designs. And the best way to anticipate how these changes will occur is to hear from companies already aggressively implementing them. “It’s already changing organizations, by moving IT from a cost center to something with a place at the table in a lot of different meetings,” said Chris Jackson, head of cloud platforms at Pearson, a global learning company. If Pearson is looking at, say, a new online learning course, Mr. Jackson is part of early product design meetings, offering tips on what user interaction data should be collected, how, and how often a course might be tweaked. A job like his used to be concerned only with things that happened later in the process, like launching and maintaining a piece of software. Public cloud computing, offered by companies like Amazon Web Services, Microsoft Azure, and my employer, Google Cloud, is still viewed by many as a cheaper and more efficient way for companies to store and process data. The cost may be lower, but like traditional computers, it is still a cost. Lower costs have been reason enough for many companies to shut down their proprietary data centers and consume computational power and attendant software as a series of on-demand services. 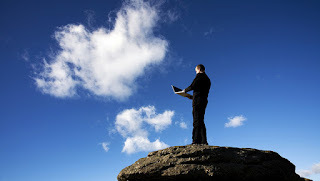 Others use cloud computing software in their own data centers, as a means of increasing resources and working faster. As cloud technology improves, however, it is becoming easier for companies to create products and services within the cloud, or model new products or marketing campaigns as cloud-based software prototypes. The cloud is also a common repository for the collection and analysis of new data, and the place where an increasing number of artificial intelligence operations, like image and speech recognition, are conducted. The evidence is already there, as startups increasingly conceive of their goods and services largely as software-centric entities, from which data is continually derived. Changes and upgrades become part of a continuous process. Organizational functions blur as processes become increasingly iterative. The ride-hailing company Uber has stressed the importance of its hybrid cloud model to ensure not just constant uptime, but an indivisible relationship between product development and deployment. Uber is able to model a virtual fleet of taxis from private cars through a combination of mobile software, large-scale data analysis, mapping, and social networking. A similar dynamic of redefined processes and constant iteration is happening with industrial products. Oden Technologies is a New York-based startup that builds sensor systems for factories, enabling continuous, precise monitoring of large and complex processes. One recent project involved building a tablet-based system for carrying out complex calculations in real time. The product, which might normally take six months to a year to create, was finished in 10 weeks, thanks to accelerated testing, and direct communication with the customer about needs and specifications during design and construction. In effect, over time the initial design and the prototype incrementally became the product, with the customer participating in its creation. The constant relationship between management theory and applied technology shouldn’t be too surprising. William Hewlett, a founding father of Silicon Valley, famously said “you cannot manage what you cannot measure.” It seems to logically follow that opposite also holds true — what and how you measure something influences the way it is managed. How soon will cloud be as influential for management as the mainframe or client-server computing? In a recent paper, Erik Brynjolfsson, Daniel Rock, and Chad Syverson found that major technology improvements may lag productivity gains for years, even decades. The most tantalizing reason why: An ecosystem of other changes has to arise, along with new thinking about how the technology should be used, in order for it to have full impact. Brynjolfsson, a professor at MIT’s Sloan School of Management, thinks software-based advances like AI and cloud-style software will find a place faster than many of the earlier advances. For one thing, lower costs mean they can be quickly adopted by startups unencumbered by legacy costs and practices. And, unlike hardware-based advances, the influence this time will be from software — in particular, what happens when teams throughout the corporation build products and services using what is termed cloud-native software. “Cloud native” software approaches stresses ease of use and low-impact alteration of components of any given software application. Massive applications are subdivided into a series of “microservices” that can be tweaked with little effect on a running piece of software. Traditional complex software often has a series of relationships, called dependencies, with other lines of code, requiring big rewrites for even trivial changes. Think of it as the way a plant’s roots can grow over a big area, and intermingle with other roots. By orchestrating microservices into highly portable units, called containers, the dependencies are potted. That means it is possible to deploy and manage an application globally, from a single location, with relatively little hassle. Kubernetes, the most popular open source software for orchestrating such container usage, was originally developed inside Google to run the company’s many global applications, and easily alter products and issue software fixes at the greatest possible scale. Google now runs about 2 billion containers a week on its in-house version of Kubernetes. Open source Kubernetes is managed by the Cloud Native Computing Foundation, which counts among its members Google Cloud, Microsoft, IBM, Oracle, and Amazon. Dan Kohn, the foundation’s executive director, has predicted that eventually much the world’s legacy software, worth about $100 trillion in net GDP, will be ported into Kubernetes, for better servicing. Blackrock, the world’s largest asset manager, recently built and released an investor research application using Kubernetes in 100 days, about the time it might normally take simply to procure computer equipment, on the cloud software it runs on its own computers. The team of 20 people represented technology, infrastructure, production operations, development and information security parts of the business. Michael Francis, who led the project, noted how Kubernetes encouraged collaboration. “I saw junior developers working directly with senior managers, asking what they were looking for,” he said. “The feedback is much more rapid.” In addition, there is less fear about taking on a big project, since the thousands of processes involved in a large software project can be transparently managed, and issues resolved quickly. Kubernetes works well, in part, because it fits a larger ethos in cloud technology, flexibility. The computer server virtualization in cloud enables more workloads per machine, and sudden influxes of data can “burst” onto other machines, even in remote locations. Data and work can also be apportioned in smaller units and dispersed, either for security or to maximize resources. As customers of public clouds typically rent computation instead of buying assets, IT spending moves from a fixed capital commitment to a more flexible operating expense. Pearson uses Kubernetes to develop, deploy and manage new kinds of online learning systems in developing markets like India and Mexico. About 10 products serve several hundred thousand students a month, and products are designed to fine-tuned all the time, as opposed to an older twice-yearly model. “It forces our internal teams to think about innovating faster,” said Mr. Jackson. “Conservatively, we can have 10 times more release activity. The software is designed to watch interactions with students, seeking ways to ensure they’re learning, and this also requires closer consultation among product people, software developers, and IT executives like Mr. Jackson, who handle resource allocation. He calls it “a redistribution of accountability” with the organization, “changing the perception of what IT is, when it becomes a value enabler.” The new way of deploying software, he said, also gives him visibility on where and how it is consumed, providing information about future costs. That modifies his job from solely capital expenditure to operating expense, and effectively a collaborator on growth. In 1967, still early days in the Information Technology revolution, John Culkin had a brilliant insight. “We become what we behold,” he wrote. “We shape our tools and then our tools shape us.” Five decades on, we have the benefit of much IT history, and can think how we, and our organizations may be shaped by new technology. As our systems and people gain in their capabilities to adapt to changing markets, every aspect of a business will become more responsive. Fixed job roles, like software engineering or financial planning, may evolve towards domain knowledge, which is shared in collaborative teams, brought together and disassembled for some part of a product lifecycle. Companies may partner more deeply, taking advantage of each other’s comparative advantage to meet a new market need. Managers will need to concentrate more than ever on skills such as collaboration, empathy, learning, and novel rewards to create an organization hopefully even more adaptive than the cloud computing IT tool it beholds.